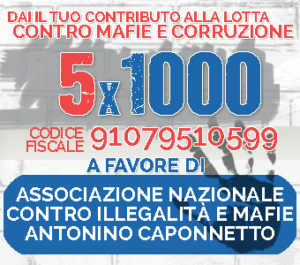 DAL 1° DICEMBRE E’ APERTA LA CAMPAGNA TESSERAMENTO PER IL 2019 ALL’ASSOCIAZIONE CAPONNETTO. L’ASSOCIAZIONE CAPONNETTO ,UN SODALIZIO DI ATTACCO. NOTIZIE,POI,DA VALUTARE E TRASMETTERE ALL’AUTORITA’ GIUDIZIARIA PERCHE’ AVVII LE INDAGINI NECESSARIE. DISTINTI E DISTANTI DA TUTTO E DA TUTTI,PUR NEL RISPETTO DI TUTTI GLI ALTRI. DETERMINATI UN PO’ COME I GENIERI IN GUERRA,QUELLJ CHE FANNO SALTARE I PONTI E LE STRADE PER TAGLIARE IL PERCORSO DEL NEMICO.